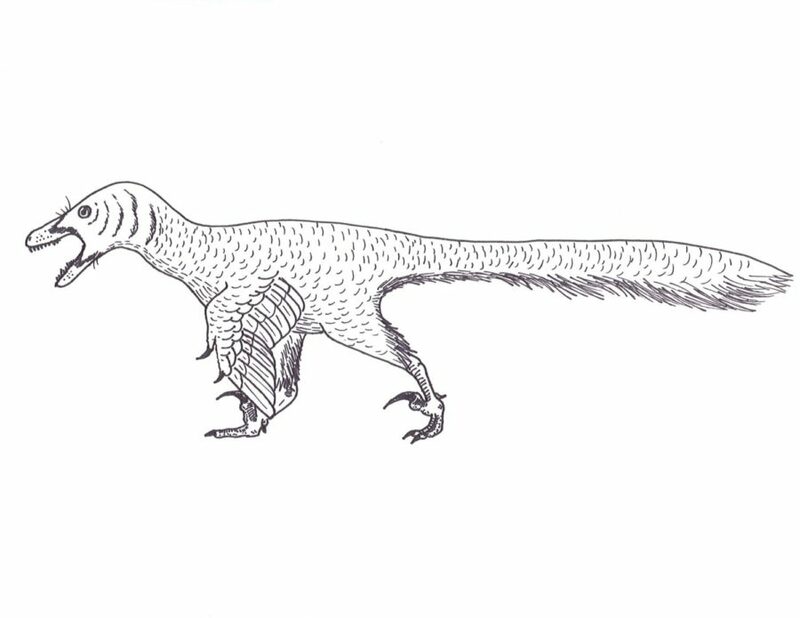 Aside from Tyrannosaurus, the small Mongolian dromaeosaur Velociraptor has probably achieved the most fame and notoriety among the general public. We’re all familiar with its frequent brushes with movie stardom within the past twenty years, although usually still playing second fiddle to Tyrannosaurus. It’s important to remember, however, that Velociraptor was a real animal, not just a movie monster created by Hollywood writers. The real animal, as near as we can tell, was actually a far cry from what most non-paleontologists imagine Velociraptor to be like. Let’s get to know this dinosaur a little better through the lens of science and illuminate the facts around it. Velociraptor was described in 1924 by the notorious autocrat of paleontology at the time, Henry Fairfield Osborne, based on a skull collected from Mongolia in the early 20’s. It had only been two years before that the very first dromaeosaur (‘raptors’ to non-specialists, although ornithologists contend its use in paleontology) had been described- the enigmatic Dromaeosaurus from the Alberta badlands, by Osborne’s colleague Barnum Brown. It would be 35 years until the next dromaeosaur species would be discovered, when Dr. John Ostrom shook the world of paleontology with his description of Deinonychus from Montana. Since then, the number of known dromaeosaurs, largely from western North America and eastern Asia, has exploded. 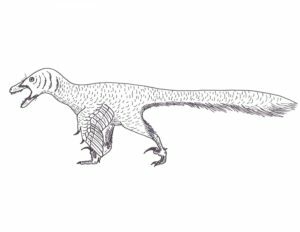 We’ve also found many more examples of Velociraptor, some of which are beautifully complete, and these discoveries have helped fill in our knowledge of what this dinosaur and its relatives were like. It should be old news by now to most readers that Velociraptor, among all other dromaeosaurs, were completely feathered. Yet something that still surprises a lot of folks who are less than obsessed with dinosaurs is that Velociraptor was much smaller than the movies make it out to be. Forget the human-sized, 6-foot tall monsters that take down hapless victims with no effort- the real Velociraptor was roughly turkey-sized. With its strong jaws and sharp teeth, it was still capable of delivering a nasty bite, but it doesn’t seem quite as threatening anymore, does it? It’s unlikely that Velociraptor picked on anything much larger than itself, but wonderful fossils like the famous ‘Fighting Dinosaurs’, featuring a Velociraptor entangled and entombed with the pig-sized Protoceratops, show that it could certainly put up a fight. Movie raptors are so big is because of the previously mentioned American dromaeosaur Deinonychus. Roughly the size of a really big dog (and scaled up a little for dramatic effect), it was once thought by some paleontologists that Deinonychus was really just a big, American form of Velocriaptor. This notion has since been rejected for a while now, but giant Velociraptors are now already seared into the psyche of pop culture. As for its hunting behavior in movies, this too was largely taken from poor Deinonychus, which was first discovered from a bonebed containing several individuals, plus a specimen of the big herbivore Tenontosaurus. It was first thought that maybe these carnivores had been members of a pack, and had died while working together to bring down the herbivore. This inference, along with the animal’s size and shape, was transferred over to Velociraptor in the movie industry. Many paleontologists today argue that these Deinonychus individuals were not members of a pack, but loner animals that were drawn to the dead or dying herbivore on their own. This type of thing can be seen in Komodo dragons today. No evidence of pack hunting has been found yet in Velociraptor. It seems that modern birds of prey- falcons, hawks, and owls- might be good modern analogies as far as hunting behavior goes. Sleek, fast, sharp-eyed hunters that spend most of their time alone. However, the Harris’s Hawk of Central to South America is known to hunt cooperatively in groups, so perhaps at least some dromaeosaurs too were pack hunters. We just don’t have the evidence for it yet. Speaking of hawks, it’s time to talk about that most part famous of dromaeosaur anatomy, the great ‘killing claw’. A vicious, deadly weapon used by these dinosaurs to slice their prey to ribbons, gash open the viscera, and deliver a lacerating death, right? Not exactly. Dinosaur claws weren’t really built for slashing and gashing- that’s what teeth are for. Sharp claws in predatory dinosaurs seem to be more useful for piercing and holding anything they didn’t want getting away from them. Analyses of the shape of the foot claws and bones of dromaeosaurs indicate that, like hawks and owls, they could probably pin-down and stab their prey using their feet, while the teeth did most of the really gruesome work. We know from the nail covering the claw preserved in some specimens that the keratinous covering was fairly dull on the inside of the curve, but the tip was sharply pointed and good for piercing small animals with. So instead of a big, scaly dinosaurian equivalent of a wolf, running around in packs and shredding larger dinosaurs to bits, we can think of Velociraptor more like a Mesozoic hawk- scanning the desert for prey, bolting after and leaping on its small, unsuspecting victim, and pinning the poor creature down with its talons before devouring it. That is, when it was successful at all. Just about every modern predator fails at least nine out of every ten attempts it makes to catch its prey. Lions, wolves, tigers, falcons, you name it. Despite their best efforts, they usually fail. That’s because the prey animals are running for their lives, and will spend more energy trying not to die. Predators are just hunting for a meal which, while important, usually isn’t worth tiring yourself out and risking injury over. There’s no reason to think dinosaurs were any different. To finish off our discussion, was Velociraptor really a hyper-intelligent genius capable of opening doors? I mean, there was obviously no doors back in the Cretaceous period, but if you brought one of these animals miraculously back to life, would it know what to do with a door if it saw one? My answer: almost certainly not, and even if it did, it couldn’t physically open a door. 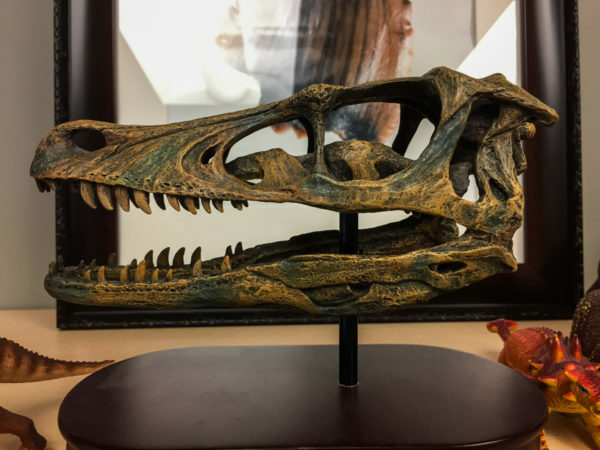 First with the brainpower- a big fuss was made over droameosaurs and their counsins the troodontids in the 80’s and 90’s when new discoveries showed their large brain size compared to their body size. Speculations of dinosaurs with the intelligence of primates were thrown around in scientific media, the meteorite being a blessing that just barely separated us from these ingenious killing machines. But don’t believe the hype. While it’s true that Velociraptor had a big brain, this is by comparison to most other dinosaur groups known at the time. While not the sluggish, swamp-bound evolutionary failures that Osborne declared them to be, most dinosaurs were still less than gifted in the brains department, having similar capabilities to modern lizards and crocodiles. Velociraptor brains were of similar size and shape to that of birds and, while this is a big improvement over the competition, it still leaves them about equivalent with a chicken on the IQ scale. And while chickens and other birds definitely don’t get the intelligence credit they deserve, they aren’t on par with us on higher cognitive performance, and neither was Velociraptor. As well as not knowing what to do with a door if it ever saw one, no dromaeosaur would be physically capable of turning the handle. This is because their arms literally could not turn like that. We as mammals can rotate our forearms thanks to mobile joints between the bones and ligaments that aren’t present in other creatures. We can pronate (turn down) and supinate (turn up) our hands thanks to these features, but most dinosaurs were incapable of this. The neutral posture of bipedal dinosaurs was to have the arms at the sides of the body with the palms facing each other. While birds and their cousins (including Velociraptor) developed a unique wrist hinge that allows them to fold their wings up, they still can’t rotate their palms downwards. So if you’re doing the typical ‘kangaroo paws’ pose when you do your best dinosaur impression, consider the ‘semi-folded bird wing’ stance instead. Scientific accuracy can still be fun, and the real Velociraptor deserves the spotlight after so long.